Can a Porcupine Shoot Its Quills? The porcupine has one of the best defense systems in nature-its quills. However, the porcupine does not shoot out these quills at an enemy, as many people think. Even though these quills are dangerous to an enemy, they are actually very loosely attached to the porcupine’s body and come off even at the slightest touch. But they are capable of killing bears, lions, and wolves, even though the porcupine, itself, is no bigger than a cat. New quills grow to replace the lost ones. 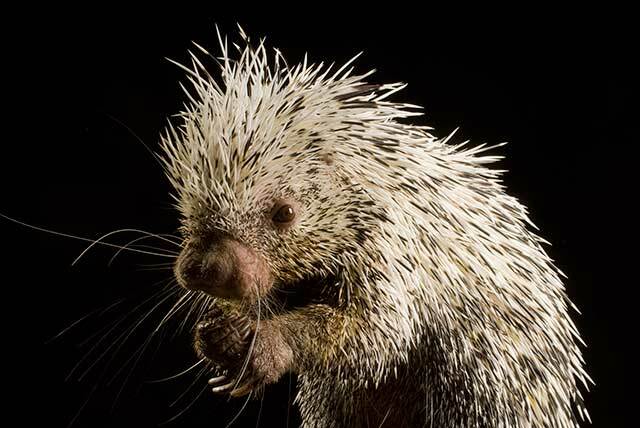 An attacker may go after a porcupine with its mouth, but the sly little animal simply turns its back and lets its enemy’s teeth sink into its quills. Since each quill is covered with tiny backward-pointing teeth, called barbs, the attacker finds itself with a mouthful and throatful of painful barbs. The attacker soon dies of starvation or from infections caused by the germs on the quills. The only creature clever enough to defeat the porcupine is a kind of weasel, which sneaks up behind the porcupine. The weasel turns the porcupine over on its back and attacks its unprotected belly. Would you believe, A porcupine’s quills are really long, sharp strands of hair that have grown together! How did the Porcupine get its Name, what does it Mean in French, and where do they Live? How do Porcupines Mate and Reproduce when they have lots of Sharp Quills or Spines in the way? How often did gunmen in the Wild West do the quick-draw shoot-out duel like in the movies?